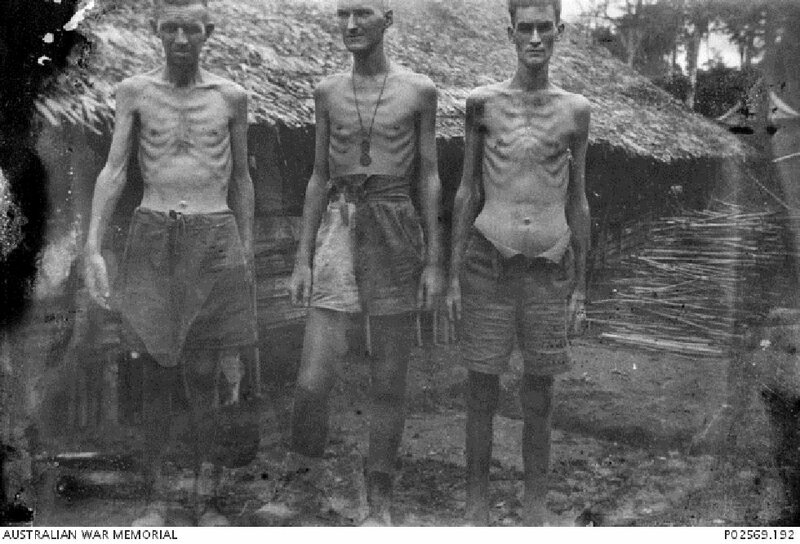 Three "fit" workers outside the camp hospitalat Shimo Sonkurai No 1 Camp, with the prisoner at the right unable to fasten his shorts because his stomach is swollen with beri-beri. In the image, from left to right, Bruce Pearce, Oscar Jackson, and unidentified. Image taken circa 1943, courtesy of George Aspinall, Australian War Memorial. The accused were the staff of the 67th Japanese Commissory Hospital on the island of New Britain in Papau New Guinea. Sergeant Major Takahashi Kohei was in charge of a group of British Indian Army Prisoners of War while Corporal Kaso Tatsuo assisted him. They were charged with illtreating the Prisoners of War by beating them and forcing unfit and sick men to work on the threat of witholding rations. Both were found guilty with the exception of "forcing unfit men to work" and sentenced to 6 months' imprisonment. The sentences passed were comparatively light compared to other cases. The crimes took place on New Britain and the difficulty of holding the trial in Singapore was evident as the prosecution had to rely only on written statements from victimes and witnesses as it was unable to transport them over from New Britain. The work that the POWs were carrying out was plantation work where they worked alongside Japanese and Taiwanese troops. Takahashi, Kohei. Sergeant Major. From Japanese military. From Japan. Guilty. 6 months' imprisonment. Sentence confirmed. Kaso, Tatsuo. Corporal. From Japanese military. From Japan. Guilty. 6 months' imprisonment. Sentence confirmed. Reade, D.H.de T. Major. From British Indian Army. Barrett, Aurthur Leslie. Major. From British military. Advocate and solicitor. Yomehara, Susumu. Lawyer of the Kyoto Supreme Court.